The filmmaker and adventurer dives deep into what it takes to get a passion project on the screen and how he united cultures on the Snowman Trek, the world’s hardest trail. In May 2018, the feature film The Snowman Trek debuted in over 400 theaters. 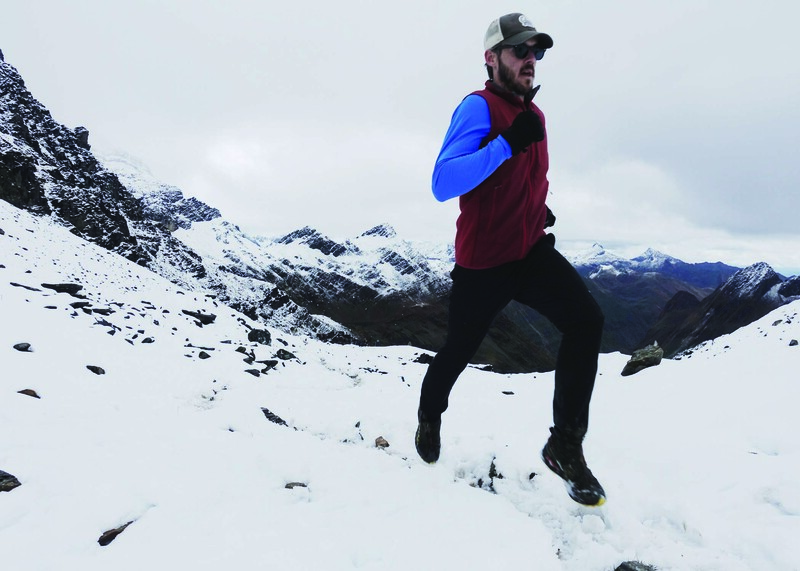 It tells the story of a team of nine—including Filmmaker and adventurer Ben Clark, Bhutanese guide Wang Chuk and ultrarunners Timothy Olson and Anna Frost— determined to set the fastest known time (FTK)on that trek, a 200-mile marathon that traverses 11 passes over 16,000 feet and is considered the hardest trek in the world. Most who take it on don’t even finish, usually due to the Himalayan weather and big-mountain logistics. The Snowman Trek focuses on the Western team sharing moments with the locals—and achieving the record alongside the required Bhutanese guides, who were skeptical when it came to moving so fast at first. Getting the film on screens might have been a harder voyage for Clark as it is for any documentary filmmaker. After years of development, nine months of bi-weekly rejection letters from film festivals and lots of self-doubt, he finally released his opus on big screens—over 400, including the sold out premiere in Boulder, where it made its global debut. In August, I caught up with the Brooklyn-and- Telluride-based Clark, where he told me about the effort it took to complete the trek and the film. How physically demanding was the Snowman Trek? Were the mental demands even more difficult when you got out there? The physical demands are hard to estimate. I wore an analog watch and chose to forego knowing daily mileage because Tim and Anna were backing up data on their watches. The trail is 189 miles long, hits eleven 16,000-foot passes (four over 17,000 feet) and I lost about 20 pounds eating mostly rice, potatoes, eggs and cheese-covered mushrooms. Clif bars were a true luxury and I was glad I had some access to chocolate. Mentally, you had to keep it together no matter what and always stay focused on safety and the goal. It was hard not to lose it once or twice out there in such a desolate area in bad conditions on that diet but you know what? Losing it comes with the territory. So those that embrace [these kinds of trips] and don’t judge tend to do better than those who do not. First, nothing original is predictable. You are looking two years into a future market with a story that has never been seen and that you hope is timeless using personal preferences and instinct to guide a project. Expect skepticism, embrace fresh perspective. Second, collaboration is vital. In time, the right team will prevail. I ask what my strengths and weaknesses are and, by inviting others to be part of the project, how the entire film can become better? If someone carries the vision with you, it will likely go further. Participation is more important than a big budget. If you make it to the point where you are ready to roll and you can sell your idea into being made, know what you are asking for—the next step is marketing, not awards. Marketing costs will often exceed the labor and post production costs of the film. Go back to step one to assess the size of the workload of this project and repeat until all three steps are done. Oh, and be sure to have fun! Do you worry that Bhutan will change? I worry that Bhutan will not change. I don’t mean that in any diminishing way, I think they are working hard to change. Already, the towns along the first three days of The Snowman Trek have electricity, because highlanders and villagers want electricity. This film projects an older world version of the wilderness that Bhutan possesses and none of the marketing about happiness or religion or food. It’s a genuine portrayal of a real relationship we established and that became friendships when we accepted all our differences. If more trail runners go to Bhutan, I think they’ll be welcomed. What do you hope people learn from this film? How does it make a difference? What can any of us do to make a difference? I hope people that see the film and get an appreciation for adventure. Support feature length films, and we will have a stronger community. Seeing people show up for two sold out screenings at a major theater in Boulder on opening night across the nation was a dream come true. It feels good to work in this industry and be able to make stories that broaden it and invite new folks to see this and the raw and real reasons exploring is good for culture—not just athletics. I hope anyone who sees the film can take something away from my experience. I wake up every morning and I pray that I will have the strength to get through another day and to do something good for someone. I have faith because even if I’m not perfect,I can look back and know I did some good things for people. I don’t know how we get our luck, but I’ve had my fair share and am very grateful for it. I’m going to go deeper into an adventure more people take on: climbing Mount Kilimanjaro. The emphasis there will be on local culture. This shoot is my third trip to the mountain and the stories I have seen in that time about a beautiful place and its people truly make me feel like this film will get a lot of younger urban folks excited about hiking. And that’s fun—to fire people up! You can watch the film The Snowman Trek, available now at geni.us/SnowmanTrek.